Lately, doctor I’ve been in a bit of a cooking funk. I rushed home from work last Thursday, brimming with excitement to finally use the hazelnuts that Oh! Nuts sent me in some banana chocolate hazelnut muffins. Sadly, those didn’t turn out they way I’d hoped and were promptly infested by ants because I left them too loosely covered on the counter top. It’s a sad moment indeed when you have to throw out tons of fancy dark chocolate and hazelnuts. I almost cried. But instead, I pulled myself together and made cookies. Because nothing makes you feel better than warm cookies straight from the oven. That is, until you realize that you left an entire stick of butter out of your recipe. Sigh. They were still delicious. I mean, how bad can chocolate and hazelnuts be? But they were a little too crumbly and lacked some of the dense, chocolate-y-ness I was looking for. Had I made them the right way, they would have tasted like chewy, fudgy Nutella. 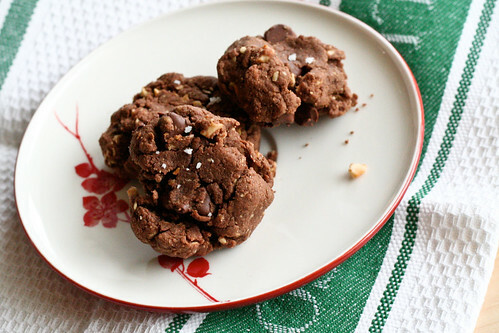 And so, I’m posting the recipe below (with the correct amount of butter) because I think everyone needs a little chocolate hazelnut cookie now and again. The rest of this week, I’m going to be trying out some Thanksgiving recipes. Everything from turkey stuffed and wrapped in goodness, to an all-vegetable side that we’re hoping will balance out the Manchego potato gratin, cornbread and chorizo stuffing, banana bread, pumpkin bread, and everything else that comes with Turkey day. I’m crossing my fingers and hoping this goes a little better than my chocolate hazelnut experiments. Wish me luck! Preheat the oven to 375° and line 2 cookie sheets with parchment paper. Place the flour, cocoa powder, hazelnuts and baking powder in a large bowl and whisk until completely combined. Using a stand (or hand mixer), cream the butter and sugar together until light and fluffy. Add the eggs, one at a time, then the vanilla extract. Pour the liquid ingredients into the bowl with the dry ingredients and mix (you may opt to use your hands here – I usually do). When they’re mostly incorporated, add the chocolate chips and mix until thoroughly combined. Use a tablespoon to measure out the dough, then roll it into small balls and place on the cookie sheet, about 2 inches apart from each other. Once you’re done forming the cookies, sprinkle with coarse salt. Bake for 10 – 11 minutes. Remove from oven and let cool for 5 – 10 minutes. Enjoy with vanilla ice cream or a cold glass of milk. Makes 3 dozen (or so) cookies. *Place 1 cup of roasted, unsalted hazelnuts (Filberts) in your food processor and pulse until there are no large pieces (about 25 times). I have been in a food funk myself. I am not in the mood or just blah. But your cookies sound delicious and I can’t wait for that manchego potato gratin! Ð§Ð°ÑÑ‚Ð¾ ÐºÐ°Ñ‡Ð°ÑŽ Ñ Ð½ÐµÐ³Ð¾ Ñ„Ð¸Ð»ÑŒÐ¼Ñ‹ Ð¸ Ð¿Ñ€Ð¾Ð³Ð¸. Ð’ Ñ‚ÐµÐºÑƒÑ‰ÐµÐ¼ Ð³Ð¾Ð´Ðµ Ð·Ð°Ð¿Ð»Ð°Ð½Ð¸Ñ€Ð¾Ð²Ð°Ð½Ð¾ Ð½ÐµÑÐºÐ¾Ð»ÑŒÐºÐ¾ Ð¿Ð¾Ð²ÐµÑˆÐµÐ½Ð¸Ð¹ Ñ†ÐµÐ½ Ð½Ð° Ð³Ð°Ð· Ð²Ð¾Ð´Ñƒ Ð¸ ÑÐ»ÐµÐºÑ‚Ñ€Ð¸Ñ‡ÐµÑÑ‚Ð²Ð¾! ÐšÑƒÐ¿Ð¸ ÑÐµÐ±Ðµ Ð½ÐµÐ¾Ð´Ð¸Ð¼Ð¾Ð²Ñ‹Ð¹ Ð¼Ð°Ð³Ð½Ð¸Ñ‚ Ð¸ Ñ€ÐµÑˆÐ¸ ÑÐ²Ð¾Ð¸ Ð¿Ñ€Ð¾Ð±Ð»ÐµÐ¼Ñ‹! ÐœÐµÑ‡Ñ‚Ð° Ð»ÑŽÐ±Ð¾Ð³Ð¾ Ð´Ð¾Ð¼Ð¾Ð²Ð»Ð°Ð´ÐµÐ»ÑŒÑ†Ð° Ð¼Ð¾Ð¶ÐµÑ‚ ÑÑ‚Ð°Ñ‚ÑŒ Ñ€ÐµÐ°Ð»ÑŒÐ½Ð¾ÑÑ‚ÑŒÑŽ! Ð‘ÑƒÐ´Ð¸Ñ‚Ðµ Ð¾Ð±Ñ€Ð°Ñ‰Ð°Ñ‚ÑŒÑÑ Ð½Ð°Ð¿Ð¸ÑˆÐ¸Ñ‚Ðµ Ñ‡Ñ‚Ð¾ Ð²Ñ‹ Ð¾Ñ‚ “#5633454″. Ð£Ð´Ð°Ñ‡Ð½Ð¾Ð¹ ÑÐºÐ¾Ð½Ð¾Ð¼Ð¸Ð¸ Ð² ÑÑ‚Ð¾Ð¼ Ð³Ð¾Ð´Ñƒ!